Saturday 27th July 2019 // 11am - 10:30pm . 18+ Event, 11am - 10:30pm, Last Entry 4pm Pay £10 now (plus fees) and pay off the rest by 12th July to pay off the balance. No refunds given for any missed balance payments. 18+ Event, 11am - 10:30pm, Perry Park, Queue Jump, VIP Area & Bar Access, Limited Edition T-Shirt & Wristband, £25 Drinks Tokens, Last Entry 4pm! 18+ Event, 11am - 10:30pm, Last Entry 4pm, Queue Jump, VIP Area & Bar Access, Limited Edition Wristband Pay £20 now (plus fees) and pay off the rest by 12th July to pay off the balance. No refunds given for any missed balance payments. 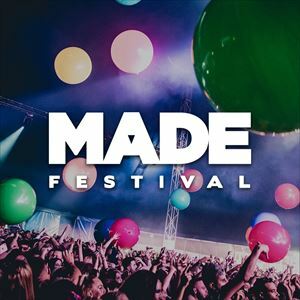 After an incredible debut year on the green fields at Perry Park, we're excited to announce that MADE Festival will return in summer 2019, bigger and better than ever before!